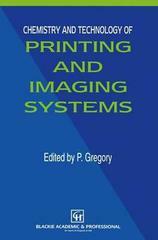 This book is of key interest to chemists and technologists working in the development of new or improved printing and imaging systems. It offers a good description of the three main printing and imaging technologies (impact, non-impact, and photography) and critically evaluates each in the light of cost, speed, performance, and suitability for purpose. The author also illustrates those areas where competition between the technologies has resulted in improved performance and benefits to the user. Because of the rapid changes in the printing technologies over the last decade, this book presents a timely contribution to the literature.